The Shiv Sena today justified the arrest of the two girls from Palghar on the outskirts of Mumbai for their Facebook post that questioned the bandh in the city. Traffic was hit in parts of Odisha Tuesday following a statewide shutdown called by a rebel Maoist group to protest the killing of five people by police in an alleged fake encounter last week in the state. The CBI court in Ghaziabad today sentenced Uttar Pradesh former Chief Secretary Neera Yadav and Principal Secretary-level IAS officer Rajiv Kumar to three years’ imprisonment and a fine of Rs 1 lakh each holding them guilty in the multi-crore Noida land allotment scam of the 1990s. It was the right mix of stardom and political bigwigs at the opening ceremony of the 43rd edition of the International Film Festival of India, Goa. Maharashtra Chief Minister Prithviraj Chavan has decided to act tough with private hospitals in the state that do not provide adequate medical facilities to the economically weaker sections of society. On the eve of the 12th Plan that promises to launch an urban equivalent of the National Rural Health Mission, an extensive survey of villages has shown that even the NRHM dream is far from being realised. n Indian health program for improving healthcare delivery across rural India. A mass protest was organised today against the recent dastardly killing of a tea planter in Assam by suspected Bodo tribal militants on November 13. A forensic expert, deposing in the twin Aarushi-Hemraj murder case, today submitted the DNA report card of the case to a special CBI court here. The Shiv Sena today justified the arrest of the two girls from Palghar on the outskirts of Mumbai for their Facebook post that questioned the bandh in the city following the death of Shiv Sena supremo Bal Thackeray. The police have arrested nine Sena activists over the attack on an orthopaedic clinic owned by Dhada's uncle in the area. While the two girls were arrested, police inaction in not arresting the attackers had drawn sharp criticism. Party spokesman Sanjay Raut said the arrest was justified as the post had hurt the sentiments of people. "We think the police did the correct thing. We support their decision to arrest the two girls. They did right under the law. No Maharashtrian would accept an insult to Balasaheb Thackeray," Raut said here today. Shaheen and Renu were arrested for posting comments opposing the Mumbai shutdown. However, they were granted bail after they furnished personal bonds. Leaders of the party's Thane rural unit, under which Palghar falls, also criticised the two girls and their families for the Facebook post. "Balasaheb is our God. We cannot stand anyone making remarks against him," the party's leader from the region, Prabhakar Raul, said. Following the aggressive stand taken by the Shiv Sena, the two girls have gone into hiding. Reports said Shaheen Dhada had deleted her Facebook account after apologising for the post. After they were released on bail on Sunday, the girls said they were treated well by the police. Meanwhile, support for the girls is coming in from more quarters. Union Minister Milind Deora today said it was wrong for the Maharashtra Police to arrest the girls. The government has already asked senior police officials to question local police officers who buckled under pressure from local Sena leaders to arrest the girls. Local Sena leaders have, however, distanced themselves from the attack on the clinic. Party leader Bhushan Sankhe from Palghar told reporters that he was not responsible for the attack and that he was only present at the police station demanding the arrest of the two girls. One of the girls held for posting the comment, Shaheen Dhada, said she will never again visit the social networking site. She had no comments to offer on whether she had done anything wrong. She described Thackeray as a "great guy" whom she "truly respected". "I have apologised for the post," she said, adding that whatever happened was unfair. Traffic was hit in parts of Odisha Tuesday following a statewide shutdown called by a rebel Maoist group to protest the killing of five people by police in an alleged fake encounter last week in the state. Operators have kept commercial vehicles off the roads in some places of Gajapati, Rayagada, Ganjam, Koraput and Kandhamal districts fearing attacks, a senior state police official told IANS. Commercial establishments downed their shutters in some interior areas the Kandhamal and Gajapati, the official said, and added that the shutdown did not affect other districts. The 24-hour shutdown was called by the breakaway Odisha Maobadi Party's chief Sabyasachi Panda to protest the killing of five people by police in Mohana area of Gajapati district on November 14. However, it is unlikely that these senior officials from the prestigious IAS cadre would spend anytime in jail as they are eligible for bail and were in the process of getting one, claimed sources, adding that today’s order would also be challenged in the high court. During her tenure as the CEO of the Noida Authority in 1995, Yadav has been found guilty of violating norms in allotting residential and industrial plots in prime sectors of Noida. She had favoured well-connected people, relatives and friends by allotting them land out of turn. She has been found guilty of violating norms in allotting industrial land plots to Flex Industries. Ignoring rules, she had also allotted plots to her two daughters. At that time, Rajiv Kumar was her junior in Noida. At present, he holds the post of Principal Secretary (Appointments) in the Akhilesh Yadav government. The CBI court had concluded the hearing of the case on November 5 and had reserved judgment for today. 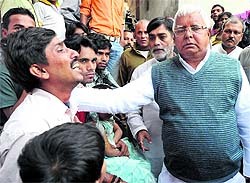 On December 7, 2010, Yadav had been sentenced to four years’ imprisonment in the Noida land scam. Strangely, she was released on bail on December 14 on furnishing a bail bond of Rs 5 lakh after spending seven days in the Dasna jail. During the week-long stint in jail, she made news for reportedly teaching children of prisoners inside the jail. Credit delivery to the priority sector, including farmers, students, weaker sections, minorities and others, is far better in the southern states, Union Finance Minister P Chidambaram said this here today. “The southern states are doing very well in credit flow for greater financial inclusion. Loans to farmers, students, weaker sections, housing and minorities and for implementing welfare schemes are far better in the southern states,” Chidambaram said at a press conference after chairing a meeting of the chief ministers and finance ministers of the southern states. The states of Andhra Pradesh, Karnataka and Puducherry were represented by chief ministers N Kiran Kumar Reddy, Jagadish Shettar and N Rangaswamy, respectively. Kerala and Tamil Nadu were represented by finance ministers KM Mani and O Panneerselvam. Chief executives of state-run banks and financial institutions also attended the meeting, which is the second of its kind after a similar meeting of the northern states in New Delhi on November 16. “Unlike in the northern states where there are some deficiencies in credit delivery and implementation of various welfare schemes, the southern states have even surpassed targets in specific sectors,” Chidambaram said. He, however, did not elaborate on which sectors north zone was lagging behind. The presence of the chief guest of the evening Bollywood heartthrob Akshay Kumar, Kabir Bedi and Perizaad Zorabain who compeered the show, the lead cast of the opening film "Life of Pi" i.e. Tabu and Irfan Khan heightened the glamour quotient of the inaugural function held at the specially erected structure at the football grounds at Panjim. On the other hand, the battery of men in power including the Goa Chief Minister Manohar Parrikar, Governor of Goa Bharat Vir Wanchoo and Manish Tewari, the Minister of State for Information and Broadcasting (Independent charge) lent it the necessary gravitas. Goa Chief Minister Manohar Parrikar reminded how his endeavour to position Goa as the destination for the festival had begun with scepticism. But now, doubts have been replaced by expectations. He took the opportunity to pay tributes to Shiv Sena supremo Bal Thackeray as well. Interestingly, the departed leader also figured in the speech of Akshay Kumar who reminded audiences of his words that actors should consider themselves lucky for they enjoy a mass following. He also recalled his love for cinema and reiterated it as the reason we all were here. He also shared how cinema was family time and much before he joined the world of cinema, his family would forgo lunch to save money and buy cinema tickets. Bollywood and its hold on the pulse of Indian audiences also manifested in the cultural extravaganza in essence in the festival’s tribute to 100 years of Indian cinema put together by choreographer Saroj Khan, reputed Assamese filmmaker Jahnu Baruah and Sajjad Ali. While the song and dance performance encapsulated the history of Indian cinema and its varying milestones, the recurring thread was made of Bollywood chartbusters - right from "Pyar Kiya to Darna Kya" to "Monica My Darling" to "Jai Jai Shiv Shankar" to "Chak De". Hindi film songs also dominated the performance of popular singer Kailash Kher who delighted listeners with his ever-resonant voice that never strikes a false note. The evening also marked the conferring of the Lifetime Achievement Award on celebrated Polish filmmaker Krzystof Zanussi who hailed it as the memorable moment of his life. Earlier in the day, the maker, who has received over 30 international awards, spoke of his respect for mainstream Indian cinema and many other issues like censorship which he believes is not an Indian phenomenon only but also prevalent in other countries. Rather, he spoke of a new kind of censorship of intellectuals. What made IFFI special, according to him, was the palpable enthusiasm. The same was reflected not only in the opening function but also at the India premiere of the opening film of the festival Ang Lee’s “Life of Pi” that saw a jam-packed auditorium at the Kala Akademy. Among other highlights of the evening was the felicitation of international jury members and its chairman renowned maker Goutam Ghose. A minute of silence was observed in the memory of departed luminaries of Indian cinema including the first superstar Rajesh Khanna, whose memory was once again evoked by none other than his son-in-law Akshay Kumar. As per a clean-up plan unveiled by the government, a four-member team will inspect records of private hospitals and institutions registered as charitable bodies. The team will also inspect institutions that have obtained land from the government for setting up hospitals on the promise of providing quality health care to the poor. The Assistant Director of Health Services will be the member secretary of the team. The other members of the team will include the Joint Charity Commissioner, the Chief Medical Officer of the civic body in whose jurisdiction the hospitals fall and the Assistant Sales Tax Commissioner concerned. As per a notification issued by the government today, the team would call for accounts of private hospitals to verify the expenditure incurred by them on providing medical care to the economically weaker sections of the society. The hospitals would also be asked to provide documentary evidence to show that they had actually provided facilities to patients under that category, the notification said. The team will submit its findings to the Additional Chief Secretary (Health). The clean-up act comes after an investigation by the government indicated that private hospitals that got a number of concessions from the government did not provide adequate relief to people from the weaker sections. One study showed that only 4.03 per cent of the beds earmarked for poor patients were actually used. Conducted by the Institute of Social Sciences, New Delhi (a research organisation working on contemporary social challenges), the study finds that half of all elected women panchayat members across the country have not heard of NRHM launched by the government in 2005 and that has since commanded a chunk of the Health budget. The programme is struggling for presence on the ground and there’s lack of convergence between the local health department and panchayati raj institutions, conceived as primary vehicles for the delivery of health goals under NRHM. The surveyors reached 400 elected women panchayat members across 19 states and found that half of them had heard of NRHM, but didn’t know the nature of services available under the same. The most disturbing finding relates to the absence of health facilities in villages with 43 per cent respondents saying there were no Primary Health Centres (PHCs) or community health centres in their gram panchayats or nearby areas and 50 per cent saying doctors didn’t visit even if the centres existed. Almost 47 per cent respondents complained of absence of paramedics at centres. In Haryana, the status of health facilities appears dismal. A whopping 87 per cent respondents said there were no PHCs in the village and an equal number said they didn’t know of NRHM; 66 per cent complained about lack of doctors at PHCs and 69 per cent said there was no paramedical staff. In Himachal, 43 per cent women panchayat members had not heard of the programme while a quarter said PHCs did not exist; 42 pc per cent doctors did not visit the centres. Free medicines are critical to NRHM’s success, but the government itself admits that only 21 states have a policy for free drug provision in PHCs. “Many states do not have the Essential Drug List,” Health Ministry’s agenda notes for the November 1 state health ministers’ meeting said. It added that NRHM convergence with panchayats was a challenge. The new study reflects these realities, with 45 per cent respondents saying no medicine was available at their PHCs. Another shocker was that 45 per cent respondents did not know anything about the standing committee on health, sanitation and nutrition in their panchayats. While 89 per cent knew about Accredited Social Health Activists (ASHAs), the cornerstone of NRHM, many knew nothing of their specific roles. Importantly, India has fewer ASHAs than the NRHM requires. The current shortage, as projected by the government, is 43,819 with Goa, Puducherry and Chandigarh having no ASHAs. The survey was conducted in Andhra Pradesh, Arunachal Pradesh, Assam, Bihar, Chhattisgarh, Goa, Gujarat, Haryana, Himachal, J&K, Karnataka, MP, Maharashtra, Manipur, Odisha, Rajasthan, UP, Uttarakhand and West Bengal. Almost 78 per cent respondents were literate. A large number of villagers, including workers from several tea estates, came out on the National Highway 52 near the Monabari tea estate in Sonitpur district of North Assam blocking the road for several hours. They demanded immediate arrest of assailants of tea planter Adilur Rahman on November 13 while he was returning from his tea estate at Tezalpatty located along the Assam-Arunachal Pradesh boundary. Similar protests by large number of tea workers were staged at Biswanath Chariali under the aegis of All Assam Tea Tribes Students’ Association against the killing of Rahman by the militants. The protesters expressed anguish at the failure of the government to apprehend the culprits. Forensic expert from Hyderabad, R Prasad, submitted all related documents before special CBI judge S Lal here. Suresh Kumar Singhla, a senior Central Forensic Science Laboratory scientist, was also questioned by lawyers. The hearing will continue tomorrow.